Toronto city council candidate Giorgio Mammoliti’s campaign appears to have been caught red-handed stealing leaflets from the mailboxes of his own constituents. 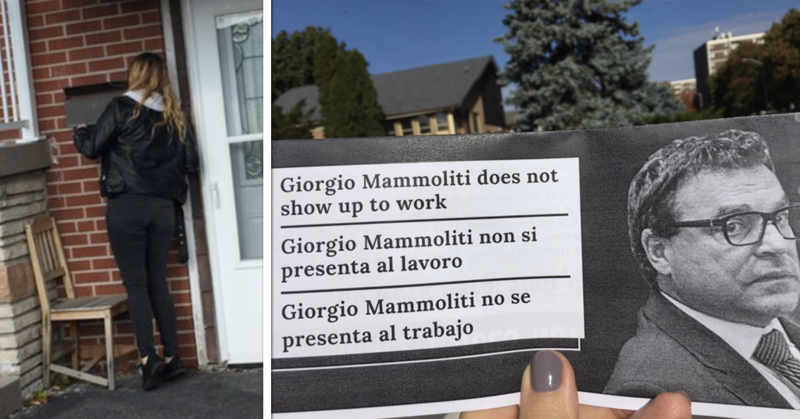 Photos taken Sunday afternoon appear to show Mammoliti’s campaign workers fishing through voters’ mailboxes and removing leaflets criticizing the incumbent city councillor’s attendance record – the worst on Toronto city council. A closer look at the photos back up Kennedy’s allegation: the photos show a woman fishing through a residential mailbox and walking away with leaflets produced by Progress Toronto, an organization working to support progressive candidates across Toronto for city council. Kennedy said the woman was holding “multiple copies” of a Progress Toronto leaflet calling attention to Mammoliti’s poor attendance record. According to an analysis by the Toronto Star, Mammoliti had the worst attendance record on city council in 2018, missing nearly half of all votes (48.7%). Between 2014 and 2018, Mammoliti missed 43.1% of all votes, which is also the worst record on city council since the last municipal election. That’s when a man “dressed in a blue ‘Team Mammoliti’ jacket” who was putting up Mammoliti election signs nearby intervened and denied she was stealing mail. “He argued that she was distributing leaflets,” Kennedy said. Kennedy’s partner followed the Honda further down the street and saw the woman hop inside the man’s car. The two drove away together. Mammoliti’s campaign did not reply to a request for comment from PressProgress. How many of these moments do you remember? 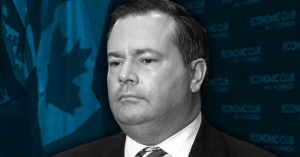 A new grass fire is flaring up for Jason Kenney and his United Conservative Party, this time involving a star candidate handpicked by Kenney himself. In a letter to UCP Executive Director Janice Harrington obtained by PressProgress, nine members of the UCP’s Calgary – Mountain View board of directors demand an immediate investigation into UCP nomination candidate Caylan Ford.